The Zinn Life: The Capsule Wardrobe - Getting there! So you've read the last two posts and, if you're like me, every other possible blog you can get yours hand on regarding a capsule wardrobe. You've read all the blogs. And you're ready. But not. Not ready at all. How do you give up the shopping? How do you only choose a certain number? What number? What ITEMS? What color? First - Breathe. It's not that serious. It's actually really fun, especially if you are at all OCD. Second - Figure out your why. Third - Purge. You're going to have to be really honest with yourself about your clothes and it's not all going to happen at one time. I'm still working through my clothes. It's better, but not completely better. Some people are all cold turkey. Me? I'm like leftovers at 8 pm on Thanksgiving Day. I like to graze. Finally - Put it back together, be amazed and go forth and prosper. I sold Jamberry for a while and I remember everyone always talking about their 'why.' A lot of direct sales training talks about knowing your 'why.' Every time I stand on my yoga mat, I think of my intention and my why. Knowing your why is really important to any new challenge in life. It's what keeps you going when you really want to go back to the way life was. It was easier then, but if you made a change, it was obviously for a reason. That old way wasn't working and so you've changed it. I went to a capsule closet because I bought a lot of crap and I never loved all that crap. I loved the thrill from buying it on sale at a super deep discount, but I didn't love it. I didn't love how I looked or felt in my clothes. Every morning was a ridiculous routine of try on all the things, hate the things, freak out because you're running late and then just throw something on your body. Kudos if it actually goes together. My weight has always been a struggle and the clothes issue was not helping in the self-confidence department. A shift in how I was buying things had already begun to take place as I started to spend more on clothes that fit better, were made of better fabrics and were actually flattering. My closet still hadn't caught up to this and it was hard to actually remember the things that fit and those that didn't. A purge was needed. Before we moved into our house, I did a major purge of things I hadn't worn in years. Some I gave away to friends, some I just gave to Goodwill. I threw away all the ratty t-shirts and only moved what I thought I couldn't live without, which was still about 75% of the crap I began with. After we moved into the house and we installed the closet, my husband challenged me to be able to put all of my clothes into our room. At that point, I had two fully loaded dressers and a fully loaded closet. I went through again. I took out everything that didn't fit and then got rid of the things in that pile that I didn't love. That left me with roughly half. Because I was trying to lose weight, I kept a good amount of clothes one and two sizes down, put them in under-bed storage and created my capsule. I had one for January - April, and another one for summer June - August. Last month, I finally decided to get rid of all of my size 10s. That's two sizes down. I'm not saying I'm never going to get there, but it's been about three years since I've seen a size 10. By the time I see it again, the clothes will be at least five years old. And, let's be honest, if I find that size again, I will be buying all the new things because, SIZE TEN. As for my size 12s, I kept two pairs of jeans, a couple tops and two pairs of work pants. I'm pretty close to a size 12, so I wanted to have something to wear when that happened. Going back to my why, I have a capsule of clothes that I know fit me, that I love (seriously, I contemplate when I wear some tops as to how close to laundry day it is so that I can be sure to have it again for the next week) and that make getting ready in the morning a cinch. Meltdowns are few and far in between now and usually only occur with pants - I'm between sizes, so they last about 3 hours after washing before they're too big. I still have a lot of clothes, more than most, but I'm almost completely out of that second dresser and I have yet to take over Aaron's side of the closet (he better watch out, though). Maybe your why is different. Maybe you want to be a minimalist. Maybe you need to curb some spending habits (hi, that's me!). Maybe you haven't bought yourself new clothes in ten years and want to buy some new ones and this is a way for you to mix in what you have and create an amazing wardrobe. Maybe you're just tired of doing laundry. Either way, figure it out before you start. It'll help you keep your sanity. There are lots of different ways to go about purging your closet. The most simple is to take all the clothes out of your closet, and divide items into three categories: keep, donate, store safely. How you decide what to put in what pile, however, is another story. Stitch Fix has a really good diagram (found here) to help you decide whether to keep an item, donate or store it. Another example of purging is the "KonMari" model, also referenced in Stitch Fix's article. Marie Kondo wrote the book, "The Life Changing Magic of Tidying Up" and talked about choosing and only keeping items that "spark joy." There are many ways to do the purge. Like I said, I like to graze with my purging. I think I'll probably be slowly purging for the rest of my life. And that's okay. How things fit will change,styles will change, YOU will change. Life changes all the time, so your clothes will too. It's okay! I do encourage you, though, to do a good purge. It makes creating the capsule that much easier. You've figured out your why. You've purged all the things. Now you have to actually do the thing. Create the capsule. Start with items that you've been wearing in the last season that you love, that you feel great in. What items carry over to the next season? For NC, I knew I needed a pair of shorts, denim capris and work capris to get me through September. I also knew that I would need some dresses. Some of my short-sleeve tops I also kept as I figured they would be good layering pieces. Look at what you have kept that will help fill in for the season. I added cardigans, 3/4 length sleeve tops, longer pants, a 3/4-length sleeve dress, a couple long-sleeve button downs and some light weight sweaters. Fall in NC really doesn't ramp up until October and is still pretty mild even then. I don't need a lot of heavy items, so I made sure I had plenty that I could layer. What are you missing? For me this year, I needed another dress and a fun color cardigan. 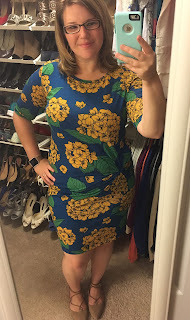 I picked up some skirts and a dress from LulaRoe. I'm still on the hunt for a mustard yellow cardigan and I've left room to keep a few items from my birthday fix from Stitch Fix. While they aren't included in my capsule, I also knew I needed to replace my brown flats, brown casual ankle booties and my magenta flats. I tried the new lace-up trend when replacing my brown flats. I'm still on the hunt for the booties and magenta flats though! Two of my new purchases - LulaRoe Julie Dress and brown lace-up flats, found here. You don't have to buy all new things with a capsule. As you can see, I start with what I have and fill in with other items. Most of my purchases for a capsule are funky, trendy pieces. I try not to spend a ton because I know they probably won't last more than a year, style-wise. I also replace whatever staples I need (and yes, magenta flats are a staple). Hopefully, this series has helped you decide if you want to try a capsule wardrobe and how to go about creating your own. If you decide to do your own capsule, I'd love to know how it goes!